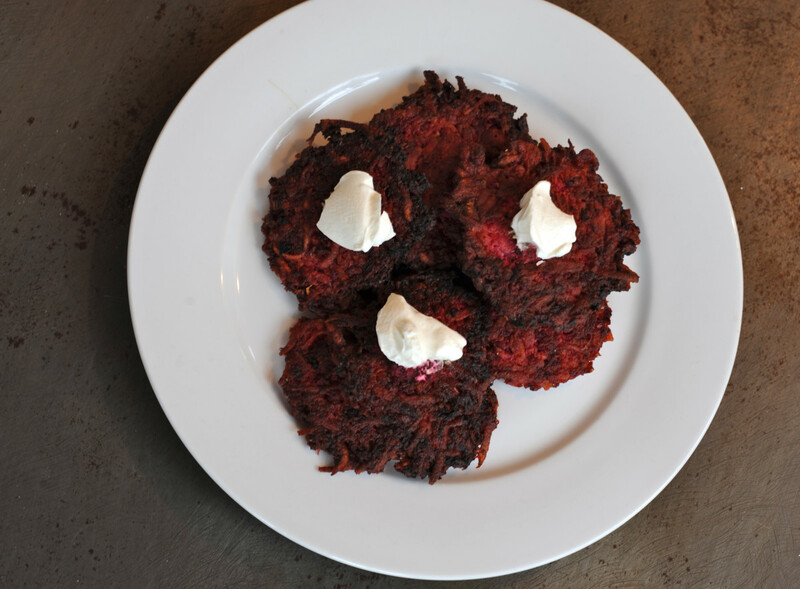 Potato pancakes get a very pretty upgrade this Hanukkah with shredded beets and russet potatoes. 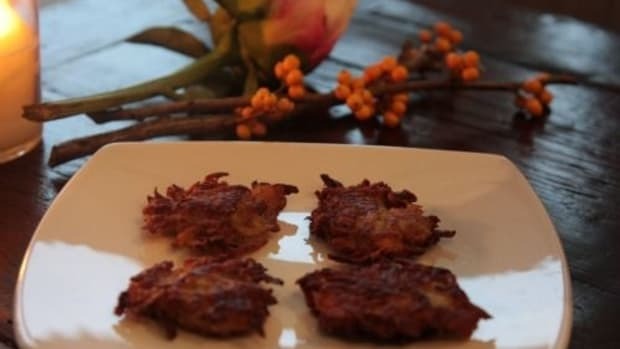 Traditionally, fried potato pancakes or latkes are made from potatoes, onions and matzoh meal. 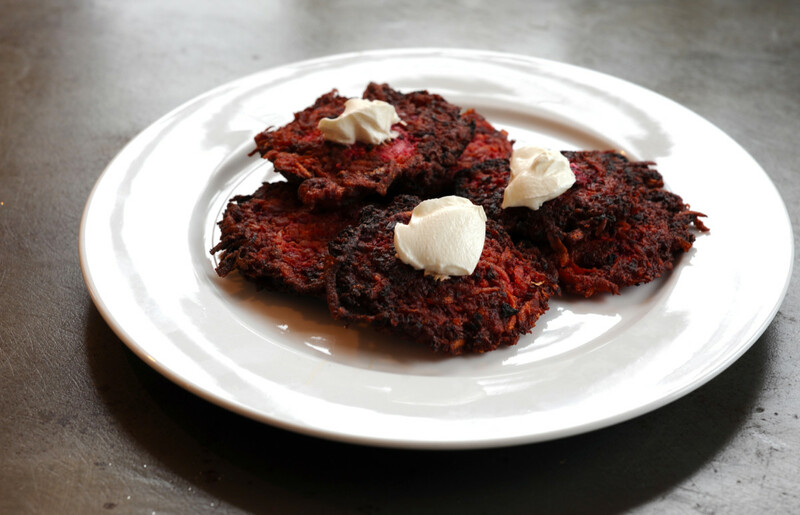 Adding finely chopped beets makes these latkes sweeter and gives them a bright pink color. Hanukkah, also known as The Festival of Lights, is a traditional Jewish holiday celebrated during the month of Kislev on the Hebrew calendar. 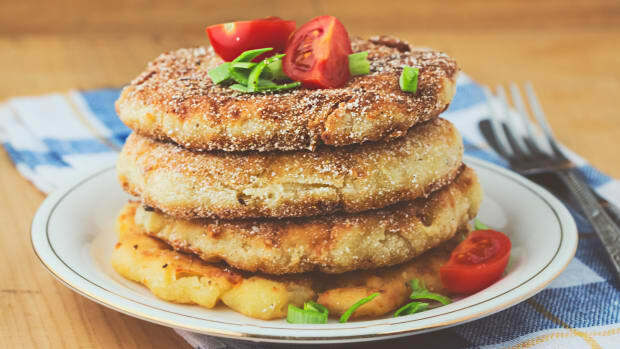 Hanukkah usually falls in mid-December and delicious traditional fried potato pancakes make an excellent winter comfort food. 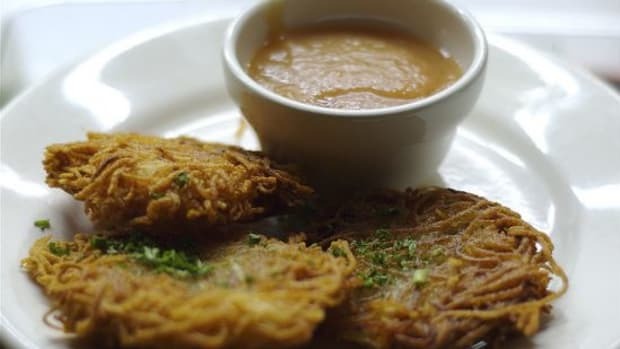 In Jewish homes and delis all over the world, potato pancakes are traditionally served with apple sauce and sour cream. The potato latke is very similar to a potato blini so for something slightly more sophisticated, shape your pancakes into smaller rounds, fry and serve with crème fraîche and a few minced chives. 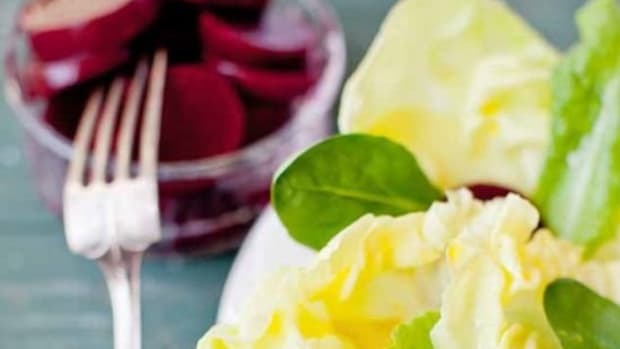 Your diners will be delighted by the color inside the pancakes but be careful while you&apos;re cooking, beet juice stains clothes and wood cutting boards. Cut the stem and bottom off the beets and peel. Chop roughly into chunks and add to the bowl of a food processor. Pulse until coarsely shredded and add to a large bowl. 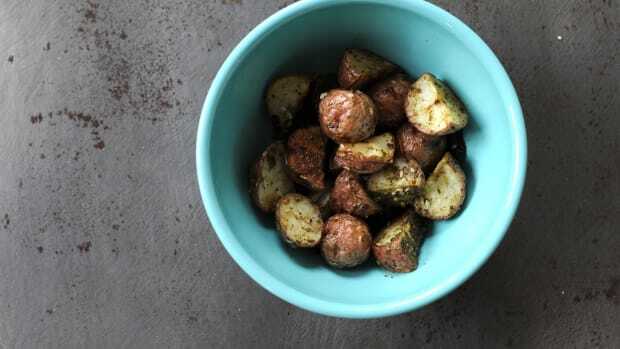 Peel the potatoes and grate on the largest holes of a box grater. 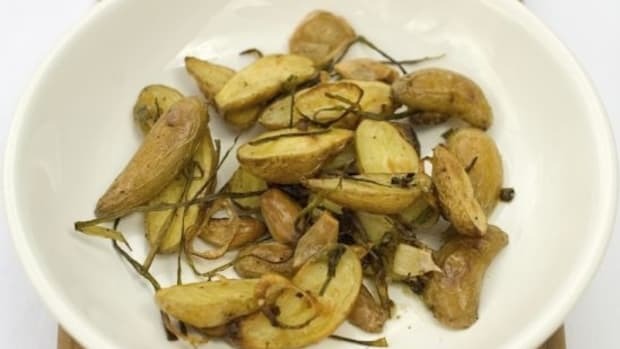 You’ll be able to grate about ¾ of the potato before you can no longer hold it. Add the remaining bits to the food processor. 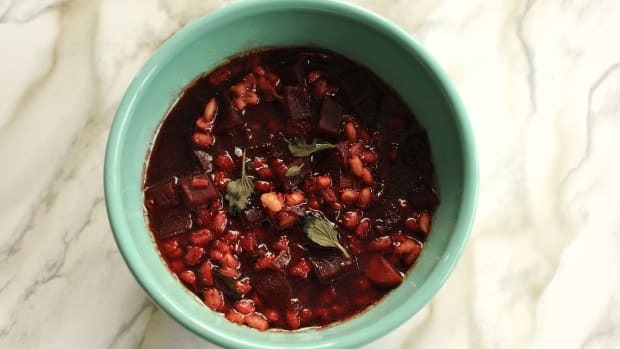 Peel and roughly chop the onion and add it to the potato ends, pulse until finely shredded and add to the bowl with the beets. Add the eggs, flour, salt and pepper to the bowl and gently mix with a spoon. In a large non-stick frying pan, heat the oil over medium high heat for at least two minutes. There should be about ¼ of an inch of oil in the pan. 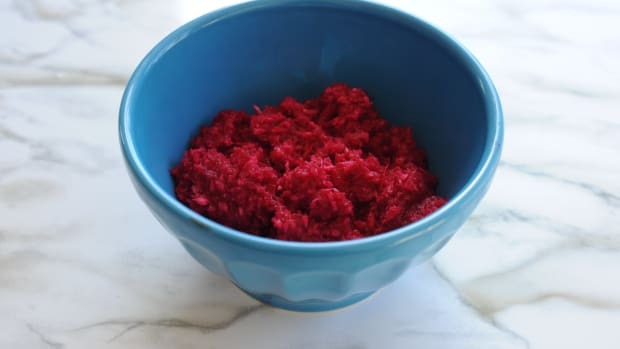 Using your hands, form about 3 tablespoons of the beet and potato mixture into a flat patty. Using a spatula, add it to the hot oil and press down. Repeat until there are 4 potato pancakes in the pan. Cook for four minutes or until browned, then flip and cook for another 4 minutes. Remove to a paper towel-lined plate to drain off excess oil. Repeat until all the pancakes are cooked, adding more oil as needed.